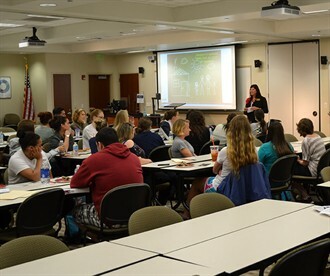 In April, representatives from the Marine Corps School Liaison and Family Readiness programs at Camp Lejeune and Oasis NC Center Director Erika Merriman visited the Watson College to share information about their work with faculty and students. Their visits were part of an outreach initiative in partnership with faculty titled, “Connecting the Community Non-Profits with Student Learning and Community Outreach.” The program gives pre-service teachers knowledge of the services available in the community and connects them to volunteer and service-learning opportunities related to their courses of study. The initiative was launched last fall by Deloris Rhodes, outreach liaison for the college. Every local education agency in North Carolina has military children. About 24,770 Pre-K–12 students in military families attend school in the 13 districts in Region 2 of southeastern North Carolina. On April 15, Donna Grady and Eileen McCallum of MCS Camp Lejeune visited campus to discuss services available to military children and families. The event was coordinated by Associate Dean Ann Potts, Outreach Liaison Deloris Rhodes and Assistant Professor Alicia Brophy. Grady, school liaison officer for Camp Lejeune, said military children move six to nine times during their school years. The transition is hardest on students in middle grades and high school. The Marine Corps offers a student mentoring program to help new students in these grades assimilate. Schools in Jacksonville are piloting a Buddy-to-Buddy program for elementary school children. McCallum, family readiness program trainer in the Marine & Family Programs Division of Marine Corps Community Services at Camp Lejeune, spoke of the stress deployments place on families and children. Periods of adjustment for families occur when they anticipate departure, are separated during the deployment, anticipate re-entry and work to re-integrate the family upon return, she said. McCallum, who has faced separation from her husband during nine deployments, said it is tough, but there are many resources available to support military families. She and Grady work hard to make sure families and teachers in schools are aware of those resources. The Watson College of Education is a member of the American Association of Colleges for Teacher Education (AACTE) and the Military Child Education Coalition (MCEC) that initiated the “Operation Educate the Educators” program to better prepare teacher candidates to meet the needs of military-connected students. More than 100 organizations are partnering through this initiative to raise awareness of the unique school-related needs of military-connected students and their families. In addition, the organizations partner with P-12 schools to provide training and resources to support the students and their families. An estimated 1 in 70 children in North Carolina has autism. In 2001, 354 children with autism were attending New Hanover County Schools, according to school system records. Oasis NC is a non-profit organization in Wilmington committed to providing instructional services and support for individuals with autism. 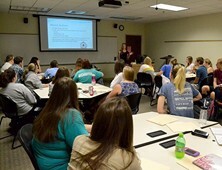 On April 23, Oasis Center Director Erika Merriman visited campus to share strategies for effective teaching and learning with students in Crystalyn Schnorr’s EDN 319 class, Meeting the Needs of Special Education in Elementary. Merriman said teachers at Oasis NC use evidence-based practices and highly individualized services and supports to target a broad range of educational, behavioral, social and communication needs. Oasis NC opened in November 2011. It now offers social learning programs, a STEM club for middle grades students and summer camp. Oasis NC recently opened the first private school in Wilmington dedicated to providing quality targeted instruction to elementary school children with autism. The students respond well in safe, predictable environments and having a routine helps to reduce anxiety, Merriman said. She advised pre-service teachers to choose their words carefully when working with students with autism “because they take what you say very literally.” She also said the fewer words the better. They use pictures and simple task lists at Oasis NC to simplify instruction for children. Social skills must also be taught. At Oasis NC, they teach students basic skills such as how to take turns, accept “no” and join in conversations and activities. Students respond well to tangible rewards such as computer time or candy, Merriman said. Most importantly, she said, teachers must be positive and accepting, have patience and set high expectations because students with autism can learn, they just learn differently from other students. A total of 15 community organizations participated in the Community Non-Profit series during the 2013-14 school year.In addition to the Marine Corps and Oasis NC, participating organizations werethe Cape Fear Literacy Council, Canines for Literacy, Child Advocacy and Parenting Place, The Carousel Center, Coastal Horizons Center, HeartsApart.org, Interfaith Refugee Ministry, The Harrelson Center, Communities in Schools, The Centre of Redemption, Dreams of Wilmington, The Miracle League and the Full Belly Project.